People tend to be divided into different categories and sometimes, it may be one or another of two different categories. That is the case when it comes to people’s dominant hands. The majority of the population will use the right hand most of the time but there is also a part of the population that uses their left hand as well. More than likely, you never stop to think too much about how fascinating it is that people may use one hand or the other. Of course, most left-handed people will consider this on a regular basis because the world tends to be set up for the benefit of those who are right-handed. That being said, there are also many other things to learn about left-handed people that are quite fascinating. 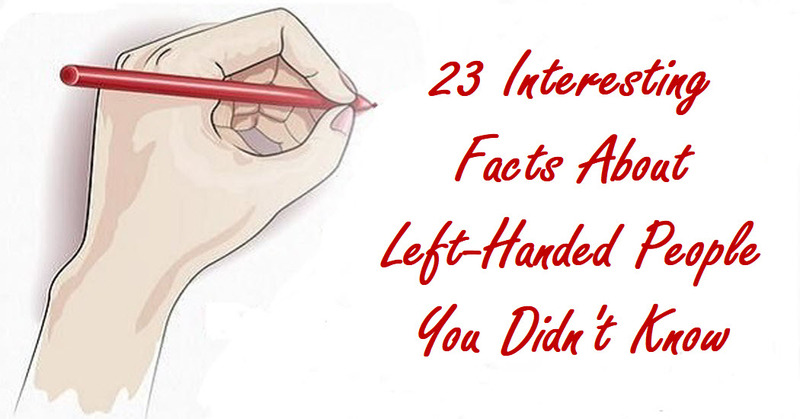 The following 23 interesting facts show you that left-handed people are not only interesting, they can be quite amazing as well. More than likely, you never knew some of these facts before. Of course, there are people who use both their left hand and the right-hand and they are known as being ambidextrous. Left-handed people, on the other hand, make up a unique part of the population and as you are about to see, they do so in style. 8. A long time ago, left-handed people may have been accused of having a bad habit, having a sign of neurosis, being rebellious or even being a criminal. 12. Left-handed people tend to be better at math and architecture. 23. Lefties tend to have a short fuse. John McEnroe is a lefty. Need I say more?